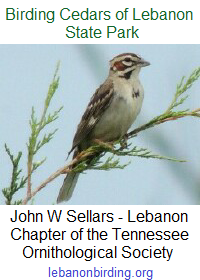 Note: * The Tennessee Living Waters class on 9 July 2016 will meet at 9:00 AM in Cabin 13 at Cedars of Lebanon State Park, but will commute to Long Hunter State Park. Unless otherwise noted, all classes meet in Cabin 13 at Cedars of Lebanon State Park. Directions to Cabin 13: Once you enter the park through the main entrance continue on past the park office on your right. When you come to the split in the road, bear to the right on W.P.A. Road. You will cross over 2 or 3 speed bumps then come to a gravel drive on your left. (at the playground across from the Assembly Hall). If you cross the bridge you have gone too far. Turn left on to the gravel drive and #13 will be the first cabin on the right.